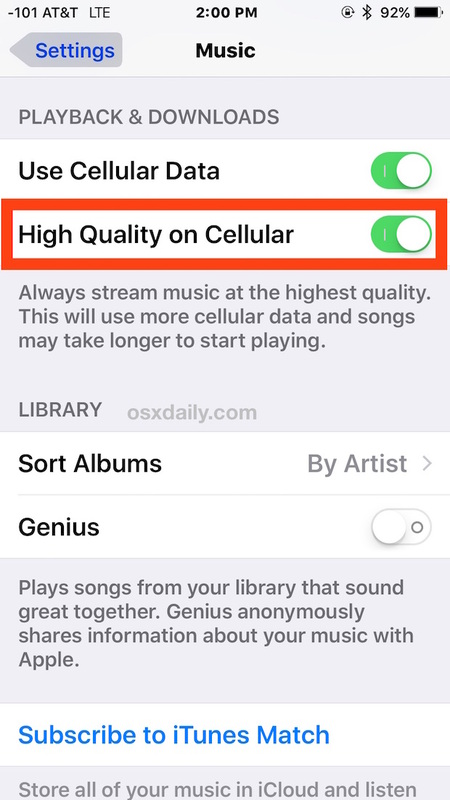 Audiophiles who want to listen to the highest quality audio streaming from Apple Music and iTunes Radio from the Music app when on the go can enable an optional high quality streaming option in iOS Music settings. While this improves the sound quality and bitrate of the songs you listen to over cellular connections, the obvious downside is that Music streaming will use more cellular data, so this is a feature perhaps best limited to iPhone users with unlimited data plans, or those who don’t care about their cellular phone bill for whatever reason. This works for streaming the highest possible quality music from Apple Music, iTunes Radio, iTunes Match, and any songs from an iTunes iCloud library. Again, only enable this if you either have an abundance of cellular data, or if you feel like shuffling over more money to your cellular data provider for consuming more than your cellular data allotment. This absolutely will use more cellular data, how much more depends on the songs and how much music you stream. Aside from the increased cellular data usage, the sound quality is notably better, particularly if you have a great sound system in a car or elsewhere to really take advantage to the higher bitrate music stream. The quality of the speakers definitely matters as well, because many users may not even notice the difference on lower end stereo systems. And if you’re listening to the music stream on a little Bluetooth speaker set or average car speakers, you’re probably wasting bandwidth, as the difference in audio quality will likely not be noticeable. If you don’t mind the extra bandwidth usage or have unlimited data, you’ll want to be sure that LTE is not disabled for best results. I don’t even want to KNOW this! My kids always chew through their data plan because they stream music on their phone. How can I force music to play in the lowest bit rate? You mean the Music app I deleted from my iPhone? Nothing in Settings to adjust. Streaming–even low-quality streaming–is too slow on my cell provider, and I’d want the highest quality for my Sennheiser cans. My answer is to turn off streaming altogether, and either download at home over Wi-Fi, or listen to something else on my phone while slowly downloading something new. You can turn off streaming altogether in the same place. But, you know, I’d rather not need iTunes Match at all. Anyone know how one gets Apple Lossless (iTunes Match maxes out at 256Kb/s AAC) into Music from an iTunes library on the local network? Home Sharing doesn’t work (streaming only), and iTunes Sync is too painful (and in any case requires physical contact with a Mac with the library on it).